Standing in a Spanish Doorway: "A Little-Known Perspective on the Life of Homeless People in France — Their Own"
"A Little-Known Perspective on the Life of Homeless People in France — Their Own"
The total number of homeless people in France (excluding refugees in the camps in Calais) is difficult to estimate, but the FNARS, a national organisation for social inclusion and re-insertion, estimates the figure to be between 150,000 and 240,000 people. 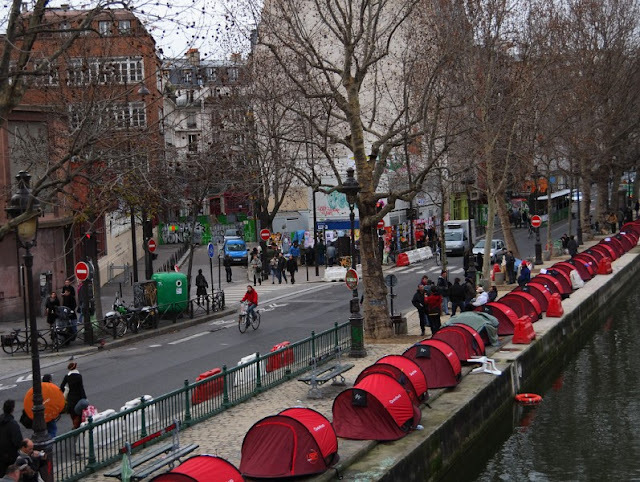 The Fondation Abbé Pierre, a homeless charity based on the benevolence of its namesake, a 20th century Catholic priest, estimates that there are 50% more homeless people in France than three years ago — including 30,000 children. A study shows that only 6% of homeless people choose to live on the streets. Many homeless people are employed on fixed-term or temporary contracts. In an attempt to correct the narrative about the homeless, some homeless people in France over the years have told their stories in their own words on social media. Let's meet three of them: Stéphane, Francis and ‘SDF75′, who all have at one point offered insight into their lives on their respective blogs. Read more from source at Global Voices here.